To look lovely while you 'look lively* ¡a a hip help lo good morale, forgowl looks and a high heart go together. Iteinemher, though Yardley beauty-things usually appear in wartime packing* nowadays, they Hill have all the qualities you know anil trust. Anonymous, Advertisement for Elizabeth Arden, 1940s. Courtesy The Advertising Archives. Cosmetics and patriotism are conflated in this advertisement. Because many of the base ingredients for cosmetics were needed for war purposes, makeup was in short supply. Women showed great ingenuity, the most famous example being that of painting a faux seam down the back of the legs to resemble stockings. 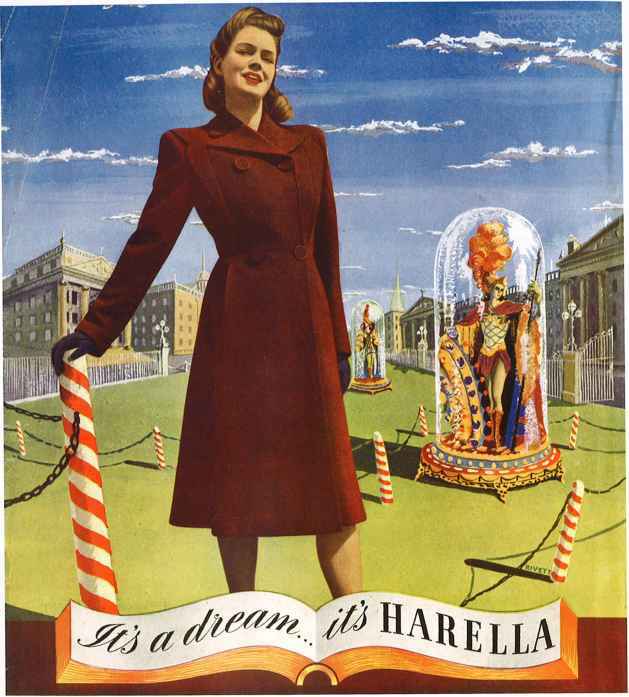 Hof, Advertisement for Yardley, 1940s. Courtesy The Advertising Archives. Yardley stresses the importance of keeping up morale by looking one's best, despite the less attractive qualities of wartime packaging. Eric, Advertisement tor L. S. Ayres & Co, of Indianapolis, 1942. Private Collection. 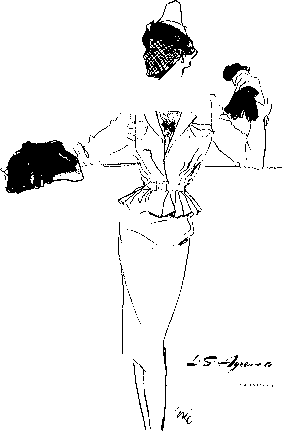 Eric's drawing of a belted suit with a gaihered peplum hints at the style of the New Look to come. Ruth Sigrid Grafstrom, Advertisement for Ftexees Combinotions and Girdles, 1942. Private Collection. 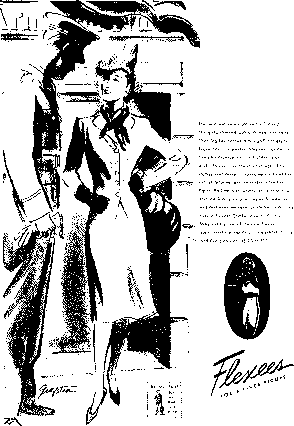 Declaring that 'Fashion-wise women know that any costume is only as smart as its foundalion', the advertisement stresses the importance of boosting the morale of the soldier on leave. A box ot the bottom advertises war bonds and stamps. From time to time, you may have found your Leo Dealer temporarily short of your favorite Loo Work Clothes. But you have been patient becauao you knew that somehow, the materials for the particular Leo you wanted at tho moment had gone to clothe a soldier. Until "Tho Groot Day" comes, Lee Work Clothes will continue to fight on many fronts. In the meantime your Leo Dealer is receiving new shipments of Leo Work Clothes as often and in whatever quantities available after military needs havo been met. Now, at always, you'll find LEE is your best buy in work clothes. If your Lee Dealer doesn't have exactly tho garment you want, ho may have a different one suitable for your purpose. If you should happen to hit one of those rare times when ho can't supply you at all, you'll bo glad you waited a few days for tho garment with this unconditional guarantee, "Your Lee garment must look better, fit better, wear longer than any garment you'vo ever worn... or you get a new one free or your money back." R. S., Advertisement for Lee Jeans, 1943. Courtesy The Advertising Archives. The USA joined the war after the bombing of Pearl Harbor in 1941. Garment manufacturers, as is stressed in this advertisement, had to put the requirements of outfitting the army first, but denim jeans, worn by blue-collar workers since the 19th century, were about to enter the fashion arena. 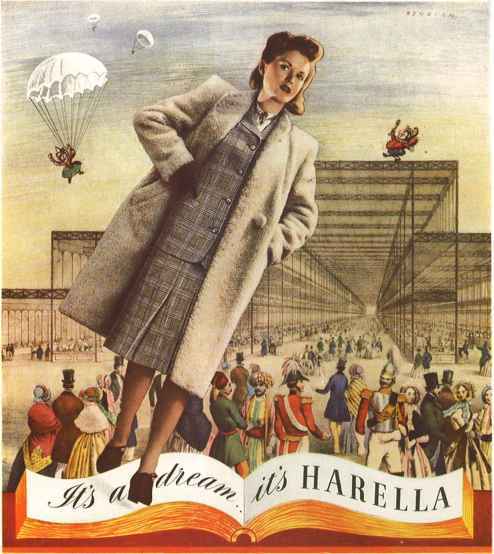 Rivett, Advertisement for Horella, London, 1940s. Courtesy The Advertising Archives. 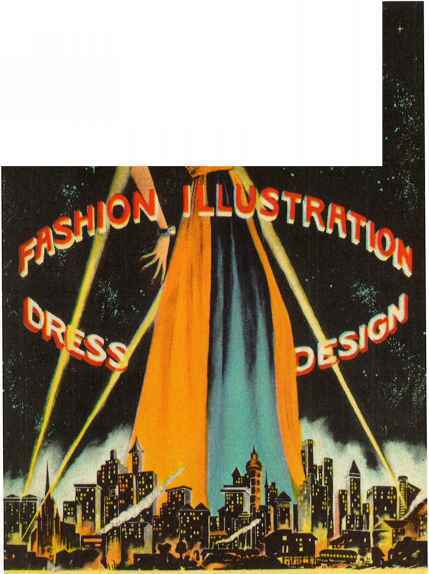 The dream-like imagery of Surrealism is invoked by a photomontage depicting a sensible double-breasted overcoat with padded shoulders, against a background of architecture and a figure of Britannia in a glass case. F.H.K. Henrion, Advertisement for Harello, London, 1940s. Courtesy The Advertising Archives. Using wartime terminology, the caption describes a Utility alpaca coat and wool suit set against the backdrop of the 1851 Great Exhibition at Crystal Palace, juxtaposed with parachuting figures and Punch. Born in Germany, Henrion adopted British nationality in 1946. Jacques Demachy, Hat by Paulette, 1943. Mixed media. Courtesy The Zahm Collection, Germany. 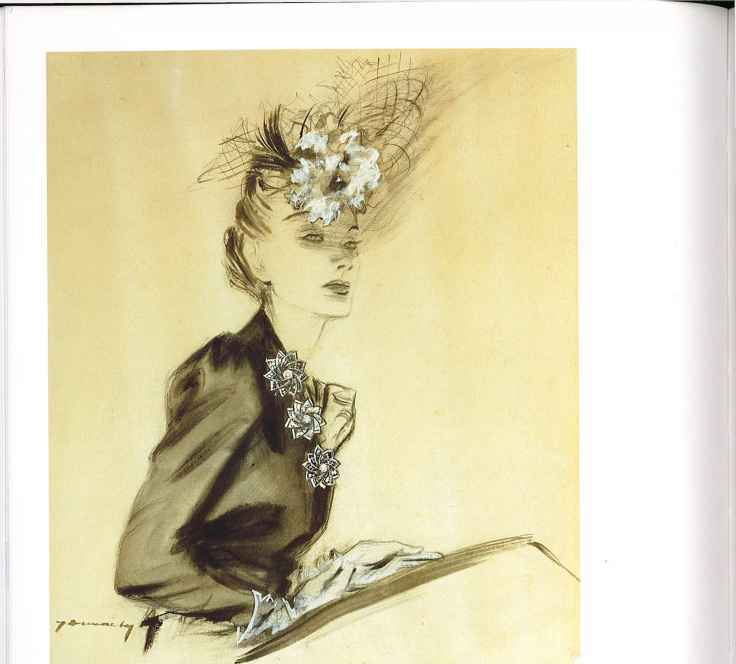 Hats were the main outlet of fashionable expression in wartime Paris. A confection of feathers, net and flowers set at the front of the head defies the dowdiness of war. Pierre Louchel, Woman in suit, 1943. Ink and watercotour. Courtesy The Zahm Collection, Germany. As in Germany, a shortage of leather brought about new styles in footwear - here platform-soled shoes, possibly using wood or cork, are worn with a smart tailored suit and a hat with a snood. After the Liberation of France in 1944, chronic shortages of textiles and cosmetics continued. offers a remarkably complete training in either FASHION ILLUSTRATION or DRESS DESIGN in nine months day school; these courses are also taught two evenings weekly, Saturday mornings and in summer school. Anonymous, Advertisement tor the Art Institute of Pittsburgh, c.1944. Courtesy CORBIS/Lake County Museum. 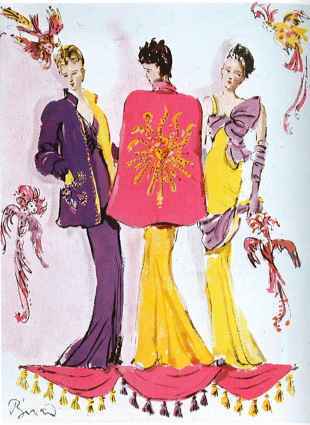 Fashion illustration was still an integral part of some fashion design courses at art colleges. Unless employed as a staff illustrator for a publication or by a department store, an illustrator was likely to be freelance. This afforded women the opportunity to combine working from home with a family. 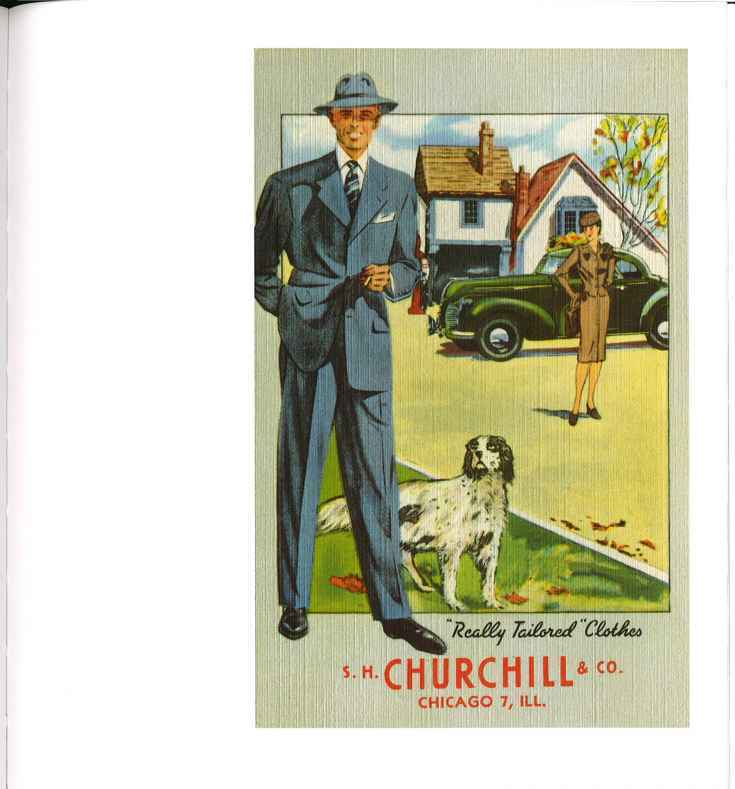 Anonymous, Advertisement for Churchill tailoring, c.1944. Courtesy CORBIS/Lake County Museum. Tailored clothes by Churchill of Chicago were given extra cachet by association with Britain's iconic wartime leader. 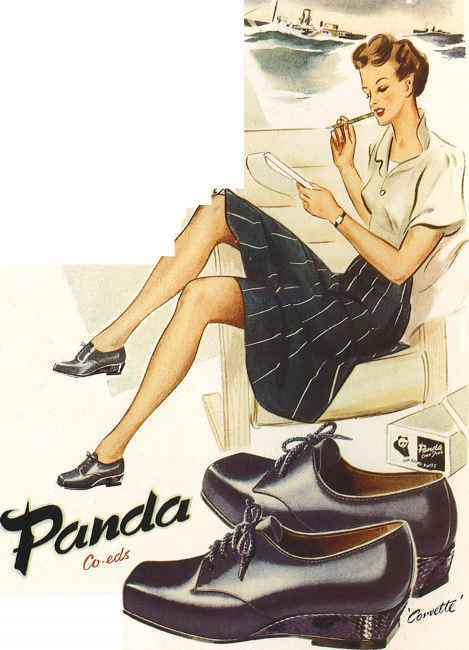 Anonymous, Advertisement for Ponda Footwear, 1940s. Courtesy The Stapleton Collection. A glamorous couple walk past a flower seller, still a favourite figure in depictions of London street scenes. At the leading ¡(ores and shoe shops in various colours of suede and calf. 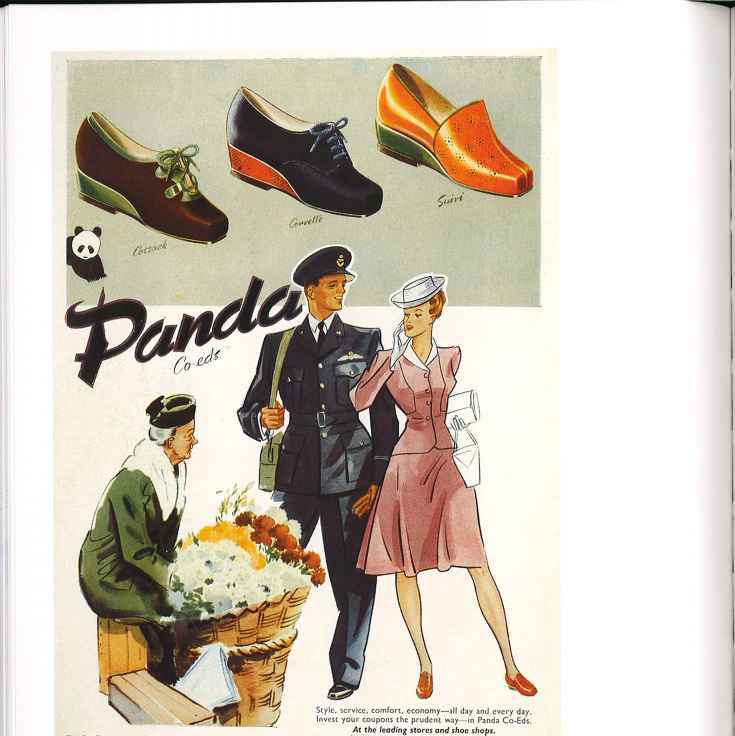 Anonymous, Advertisement for Pondo Footwear, 1940s. Courtesy The Stapleton Coilection. A pair of 'Corvette' co-eds, named after a type of battleship, is gratefully purchased with a gift of money or coupons. 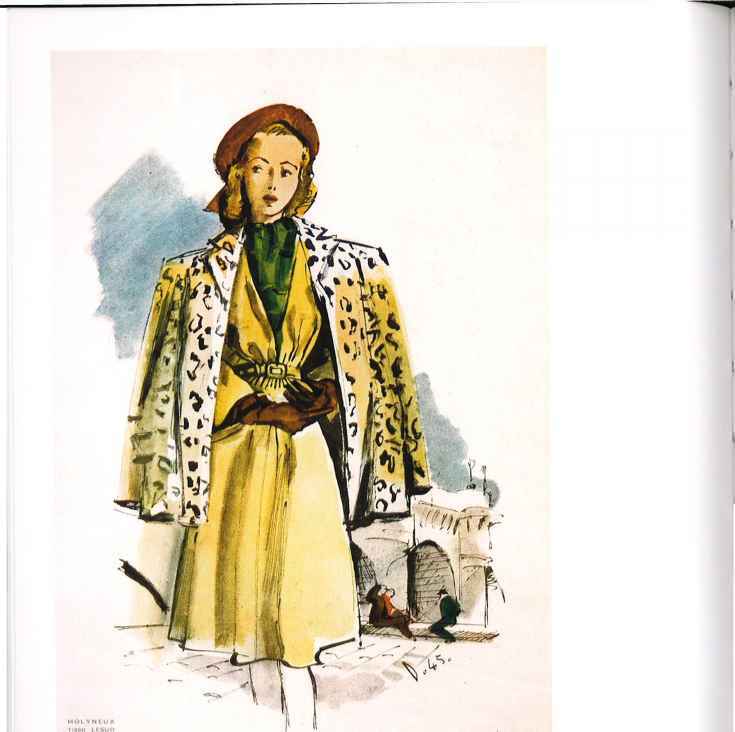 Alexandre Delfau, Molyneux dress and leopard coat, La Femme chic, Spring 1945. Private Collection. 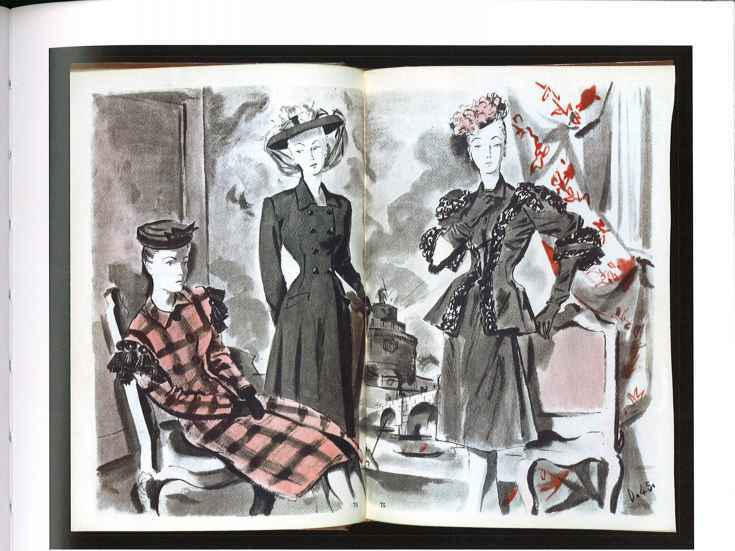 Known for his reliably elegant clothes, Molyneux's long career started in London with Lucile. Alexandre Delfau, Winter outfits by Balenciaga, Plaire, Vol. II, 1945. Courtesy V&A Images/Victoria and Albert Museum. Balenciaga, one of the most admired couturiers in Paris from 1937 until his retirement in 1968, hints at the new silhouette, distilled by Dior in his 1947 collection. 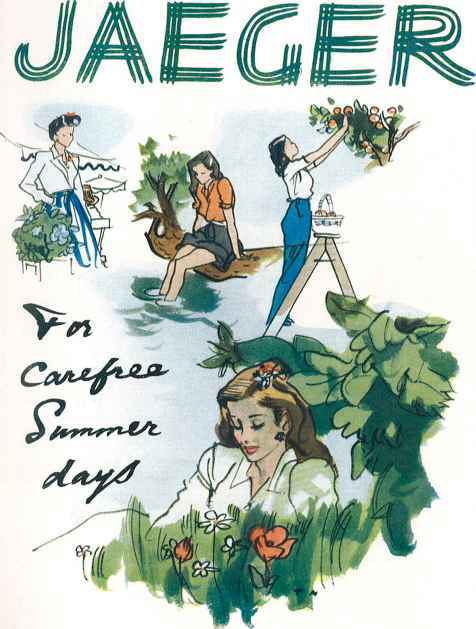 Francis Marshall, Advertisement for Jaeger, 1945. Courtesy The Advertising Archives. Peace brought with it a new optimism. 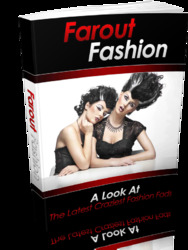 Long hair, modelled on styles worn by movie stars such as Gloria Swanson and Veronica Lake, was now fashionable and trousers - or 'slacks' as they were more commonly known - had finally been accepted as more than mere workwear or sportswear. PERFECTION in dress and ■ economy are best served by selecting suitings that after long use show little signs of wear. A suit of such cloth made by an expert tailor is astonishing in distinction of excellence throughout a long life. A long life is very desirable to-day. The more reason then that the suit is one that will please and neither tire nor annoy its owner in any way. Texture, pattern and particularly fitting must all appeal and continue to satisfy. Burberrys can be relied upon to supply the above essentials.